Cone-bearing trees and shrubs (conifers) are found worldwide. Conifers with needles are in the Pinaceae (pine) family. Pines are divided into species by the number of needles in a typical cluster. Conifers with scale-like leaves are in the Cupressaceae (cypress) family, which includes cypress, sequoias, cedars and junipers. Cones are round or oblong seed casings covered by woody, overlapping scales. Some cones are small, others may be up to 20 inches in length. Cones are a cluster of woody scales tightly packed to protect the seeds inside. Pines (genus Pinus) are the most common cone-bearing trees. There are approximately 100 species of pine in three subgenera. All pine species have narrow needles arranged in clusters of two to five, ranging from 1 to 7 inches in length. Depending on the species, needles may be soft and flexible or stiff and spiky. 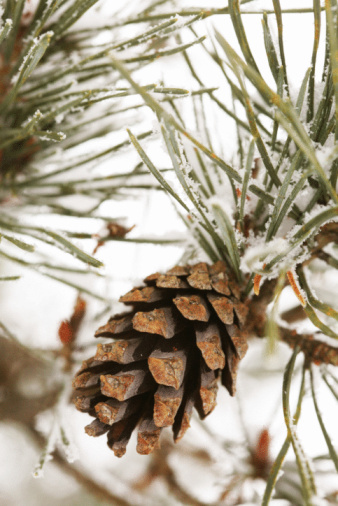 Pines are evergreen and retain their needles up to five years. Unlike most cone-bearing species, larches (genus Larix) are not evergreens. In the fall, the needles turn brilliant yellow and fall off. Ten species of larch trees are indigenous to the northern hemisphere. Larch needles grow differently than most needle-bearing conifers. Needles sprout singly from new twigs on larch branches, but older twigs sprout dense clusters from knobby protrusions. Firs, also called balsam firs, are classified in the genus Abies and characterized by small pockets of resin that permeate the bark. Needles are short, soft and aromatic. Fir cones are located at the topmost branches. The Douglas fir, a familiar Christmas tree variety, is not a fir at all. It is classified in its own genus, Pseudotsuga. Cypress trees are evergreens distinguished by root formations that rise from the ground around the trunk of the tree, commonly called knees. Cypress leaves are small and scale-like on most species. Cones are small and round. Giant redwoods represent some of the tallest and oldest trees on earth. They are indigenous to a small area on the northern California coastline. Giant redwoods live up to 2,000 years. The leaves are hard and sharp, with silver undersides. Cones are small and egg-shaped. Junipers are fragrant evergreen conifers that produce fleshy cones used to flavor gin. Depending on species, leaves may resemble needles or scales. Juniper has the largest geographic distribution of any woody plant and grows all over the world.